StockHouse Sessions, an intimate evening of quality food and amazing music, present Roll Over Beethoven, the greatest exponent of Rock n’ Roll, London’s Camden Cat Daniel Jeanrenaud with James Delaney on Keyboard (toured with Chuck Berry & Van Morrison), Simon Farrell on double bass (toured with Imelda May) and Shane Atlas on Drums. Daniel Jeanrenaud, either solo, or with his killer 3-piece band The Camden Cats, this is the man who will get your party started. 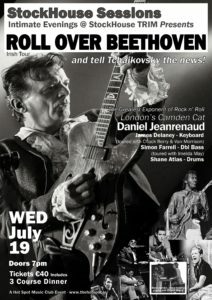 With a sound and spirit straight of the old-school juke joints where rock & roll was born, Daniel Jeanrenaud is one of last real carriers of that authentic, explosive sound and attitude. This not to be missed event takes place July 19th 2017. Tickets are €40 which include a 3 course meal. Booking essential.